You ask any tourist about the prime reasons they prefer Pantai Cenang as their vacation venue in Langkawi. The first universal reason is of course the beach. 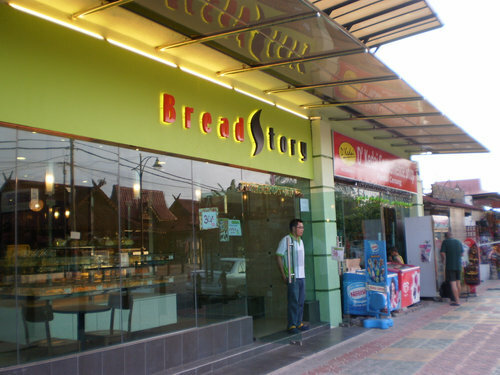 The second often sways between food and shopping. 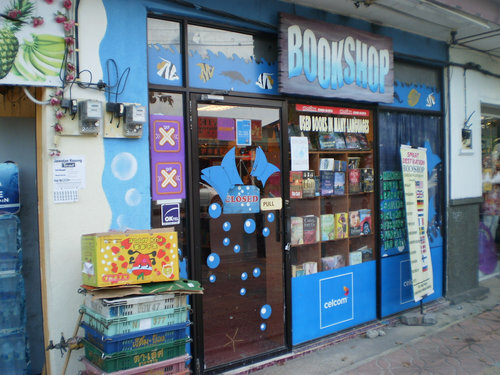 As you stroll along the sidewalks of Jalan Pantai Cenang (the main street here) which runs parallel and close to the beach, you will find numerous shops and restaurants lined up on both sides. And in the evenings when the lights come on, they start glittering in full colors. On the right is Wakaba Japanese restaurant in the upper floor. There is a Supermarket inside. At the back side there is a store selling cheap beer (only RM2.50 for a can of Heineken). There is also a chocolate store. 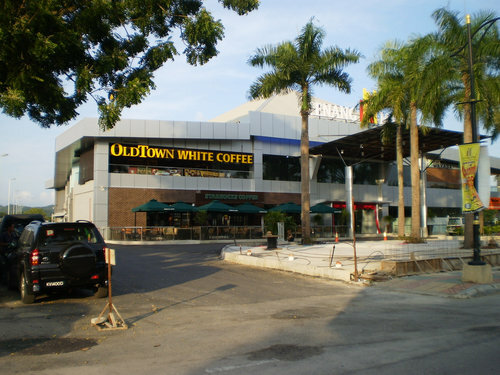 So overall this mall is meant for comfortable shopping and has been increasingly attracting tourists. There is a Maybank there with 24-hour ATM. 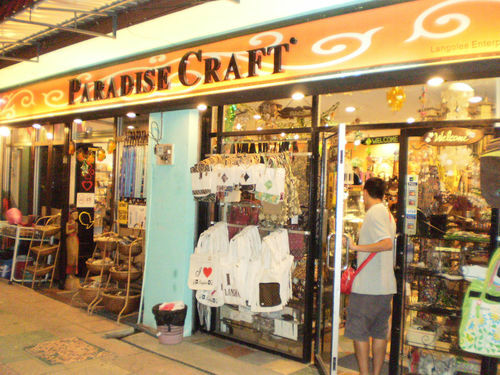 A store having large stock of handicrafts, stones, jewelry and lot of other stuffs. A great buy here would be the white bags that have 'I Love Langkawi' imprinted on them. There are bags of different sizes. It's air-conditioned inside. 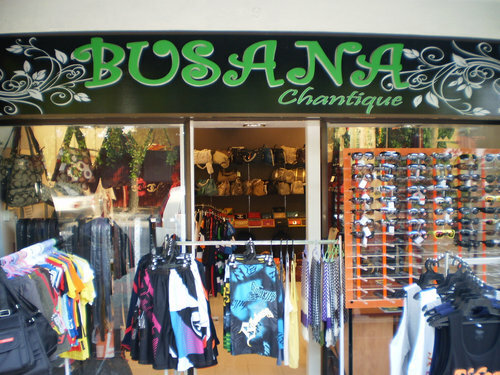 Update October 2014: Izman conceived this idea in 2012 to have a handicraft boutique shop in a bus. Then everyone thought it was a crazy idea. But now he is well on his way to great success having created the mobile store. You will see this bus on the road Jalan Pantai Cenang selling handicraft items, accessories, baby accessories and even clothing. Most items are hand crafted personally by Izman's Canadian wife. They also promote Malaysian batik art to islanders and tourists. Selling lots of knick knacks including bags, hats & caps, ladies shorts, handmade sandals ... and all for very reasonable prices. This is the night market that sets up in Pantai Cenang on every Thursday. The night market is held in different places on each day of the week. 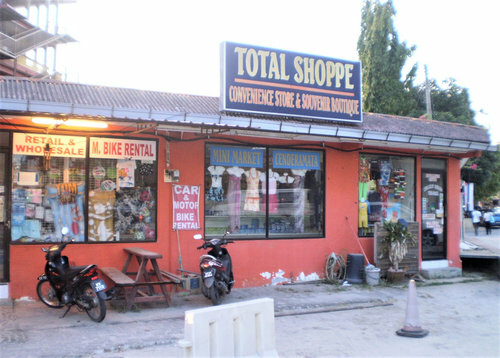 If you are staying overnight in Pantai Cenang on a Thursday, then don't miss this country bazaar type of market hedls at the Temoyong village close by. 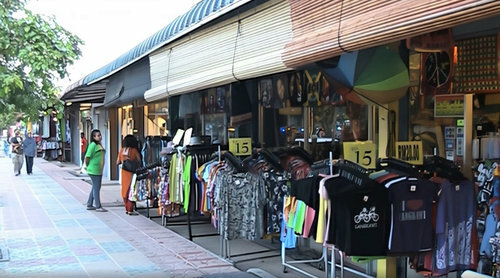 Although the night market is well known for a range of cheap local food, the vendors also set up stalls to sell clothes, souvenirs & gifts and even cheap electronic items & watches. 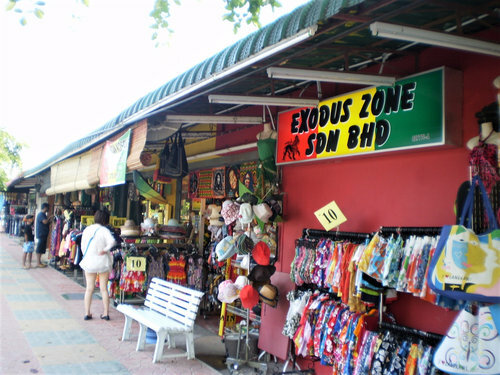 Check out Langkawi Night Market to know more. This is a cool store. 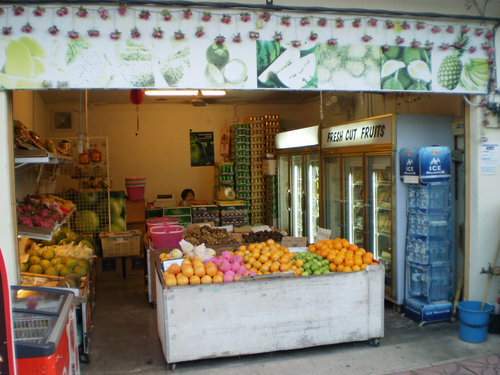 Not only does it sell fresh fruits, but also mineral water bottles and can beer. 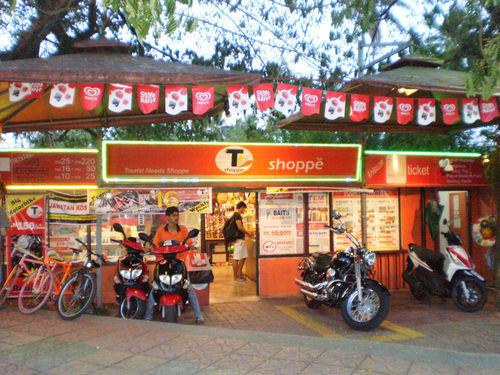 You will find all kinds of beer brands here including Carlsberg, Tiger, Heineken etc and beer is cheap. You can pick up a few cans and have it while you dine in one of the restaurants on the opposite side of the road. Some of the restaurants here do allow you to walk in with your own beer because they themselves don't serve drinks. We stopped by at Durian King, a shop which sells fresh durian and processed durian products. The shop is run by a Chinese gentleman and when we enquired about the price of fresh durian known as Mau Sang, he clearly told us the price Was RM50 per kg. Both my husband and I heard this. We did not question him further and we accepted this price as Mau Sang is sold for approx'. RM45 per kg in Kuala Lumpur. The durian we ate weighed 1.03 kg (according to his weighing scale). Hence, the price he said Was RM53 for that durian which had only 6 seeds in it. when We finished eating, and wanted to pay him RM53 he told us that the price was RM83 instead. We did not make any mistake with the initial price. He is dishonest and unscrupulous and took advantage to increase the price after we had finished the durian. Please look into this complaint as other tourists should not get cheated like this in future. We hope you will take action against this scoundrel and investigate his dishonest business tactics.